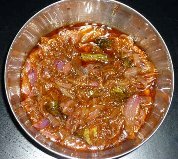 Posted on March 15, 2014 by Ahila	• This entry was posted in Breakfast, Dinner, Non-Vegetarian, Vegetarian, Western province and tagged Colombo, Onion, Recipe, Sambol, Seafood, Side dish, Vegetarian. Bookmark the permalink. Welcome back Anila 🙂 Lovely recipe. Thank you, Linda 🙂 I have been a bit busy to record and transcribe my mother’s recipes so am only posting recipes sent me. Thank you, Ronit 🙂 Nice to be back too. I like your recipe for cardamom friands and have bookmarked it to try it out sometime. Thank you, Indu 🙂 Yes, I am fine and thank you for asking. I have been busy with work and travelling so was not able to focus on any of my blogs. I imagine this dish is as enjoyable to make as it is to eat. I can almost imagine the aroma from the pan while it cooks. Yes, Hilda 🙂 and it is one of the quintessential Sri Lankan dishes.